Pleased to announce the Plymouth Superhero Calendar has raised £1,315! Over a series of weeks the team helped raised awareness of Stokes and the Stroke Association leading up to Christmas 2016 and beyond. This is a great example of how a community can come together to help a fellow colleague and raise awareness of the Stroke Association a charity solely concerned with combating stroke in people of all ages. On Sunday 11th September Jason Kiely suffered a stroke. After surgery he spent a number of weeks in intensive care and after three months in Mount Gould Hospital receiving fantastic care from the nurses there, Jason is recovering well at home and improving day by day, but there is still a long road ahead. Jason at the age of 45 was in need of our help and support. He’s a great guy who is always thinking of others and a range of fund raising activities were held to support him and his family through the Christmas period and into the new year. 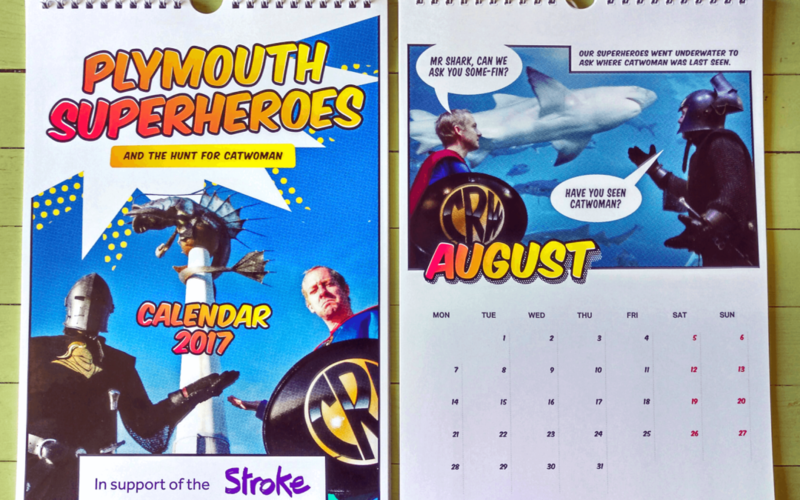 The Superhero Calendar is part of these activities dreamt up by Andi Hill, Scott Grenney, Paul Bushell and Tony Cobley, a calendar dedicated to raising awareness of Stroke and The Stroke Association. On one sunny November day in Plymouth, a small team of people got together to drive around Plymouth jumping out to take photos for the calendar at various locations across the city. It was a long day, but we hope you enjoy the results! Proceeds from the calendar will go to Jason’s family and the Stoke Association. For donating their time to help make this calendar happen.